This flick has received some negative reviews, but I disagree with those critics. In this second installment of the franchise, we follow the same galaxy saviors who have now become a full-fledged team that can be hired at the right price to do tasks that others can't do. We get everyone back including: Chris Pratt, Zoe Saldana, Dave Bautista, the voices of Vin Diesel and Bradley Cooper, Michael Rooker, Karen Gillan, and a couple new faces such as Pom Klementieff, Kurt Russell, Sylvester Stallone, and a few more. The sequel is different from the first movie because Thanos is not the main focus. Instead, we see Peter finally meet his father Ego, played by Kurt Russell, and the movie revolves around their new relationship. They must also escape an alien race--and they have Rocket to thank for that (typical Rocket). The movie flowed very nicely and I enjoyed the fun it brought to the audience. Two guardians that stuck out more in this film than the last are Baby Groot and Drax. Baby Groot was the cutest part of the film in every one of his scenes, and Drax brought a lot of comedic relief with all his lines. I cannot wait for the third installment, and I am really excited to see the guardians meet up with the avengers in Infinity Wars and take on the big baddie Thanos. 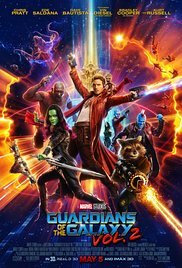 Go watch this flick and see how Peter deals with his new father and other past attachments in his life in this exciting, fun, funny, thrill of a Galaxy ride Marvel movie. Also, there's a total of five during and after credit scenes so stick around.